Cloud computing technologies have transformed how organizations design and operate their data centers. More than ever, they must find a cost-effective means to scale capacity to support business growth, maximize infrastructure utilization, and increase operational efficiency and business agility. This requires a resilient and adaptable network that can facilitate the rollout of new services or applications in real time. The underlying infrastructure must be able to consolidate network resources into shared, reusable assets, allowing administrators to more efficiently distribute workloads and manage peak traffic while adhering to Service Level Agreements (SLAs). Moreover, it must allow organizations to streamline data center operations and automate workloads within their virtual and physical infrastructures, to help ensure predictable and reliable service delivery. Brocade application delivery solutions provide the flexibility and scale to meet the demands of service-driven data centers—all without compromising on performance and reliability. Whether an organization requires purpose-built hardware or shared multitenancy systems, the Brocade ServerIron ADX 1000, 4000, 10000 Application Delivery Switches provide a full range of platform options. The Brocade ADX Series is used by the world’s most demanding service provider networks and large enterprise data centers. With the Brocade ADX Series, these organizations gain a highly scalable and carrier-grade platform designed to ensure the cost-effective, reliable delivery of cloud services and maximum Return on Investment (ROI). The Brocade ADX Application Delivery Switch offers the flexibility and scale to meet the demands of service-driven data centers-all without compromising on performance and reliability. Whether an organization requires purpose-built hardware or shared multitenancy systems, the Brocade ADX Series provides a full range of platform options. A flexible and highly scalable system architecture is at the heart of the Brocade ADX Series. As a result, these switches can provide superior performance and scalability as well as low-latency switching (20 microseconds) for response-sensitive applications. The Brocade ADX Series is built on a distributed architecture that helps maximize application performance while ensuring complete physical separation of the management and data planes. It features a high-density, multicore architecture and dedicated switching fabric to simplify network deployments and enable high-speed interconnects among application, management, and interface modules. Maximum infrastructure efficiency: Consolidates multiple Brocade ADX instances on a single platform, providing maximum infrastructure efficiency while reducing costs associated with power and cooling, rack space, license management, system maintenance, and administration. Tenant flexibility and operational simplicity: Enables maximum flexibility to mix and match capacity, features, and services according to change in demand. Provides on-demand provisioning, unified management, and monitoring of multiple Brocade ADX instances via a common control plane, in support of true cloud service delivery. Full tenant isolation: Allows multiple, fully isolated Brocade ADX instances to run on a single physical system—each with its own system configuration, network stack, resource, and management—when the Brocade ADX Series is deployed as a shared device. This hardware-based virtualization of the Brocade ADX system helps ensure security, compliance mandates, and adherence to service SLAs. Complete high availability: Ensures that applications and services are always available by providing redundancy at both the device and tenant levels. As a fully isolated tenant on a shared device, each Brocade ADX instance can be deployed as a high-availability pair in either an active/standby or active/active configuration. Organizations can enable comprehensive configuration synchronization for increased redundancy of the device and all tenants that are enabled on it. All Brocade ADX switches can be quickly upgraded in the field using software license keys. This allows organizations to enable a full suite of hardware and software options when needed without taking the platform offline. Organizations can quickly increase performance and port capacity, as well as add advanced features to the Brocade ADX 1000 Series switches, with a simple software license upgrade that supports the “pay-as-you-grow” deployment strategy. The capacity expansion is also available for the modular chassis platforms of the Brocade ADX 4000 and 10000 Series, which can leverage interchangeable modules. Growing demand for IP-based services, combined with the move to cloud-based networking, presents new opportunities for today’s organizations. The rapid growth of billions of Internet-enabled devices and applications has led to IPv4 address depletion. As a result, thousands of organizations are seeking to enable next-generation IPv6 for their products and services as a way to mitigate further Internet growth. The Brocade ADX Series offers a pragmatic strategy for IPv6 transition and IPv4/v6 co-existence by enabling organizations to maximize their existing IPv4-based investments while connecting with the growing IPv6-based world (see Figure 1). The Brocade ADX Series supports all major use cases on both IPv4 and IPv6—and with near-equivalent performance. For modern applications running on a modern OS, Brocade recommends running dual stack on the server with dual-stack Application Delivery Controller (ADC) functions. Brocade also supports dual-stack GSLB for application redundancy. The Brocade ADX Series scales existing services and interconnects IPv4 or IPv6 network islands using gateway-based, large-scale NAT services (444 or 64). For large networks of IPv4-only endpoints (legacy) or IPv6-only clients (such as 4G mobile headsets) in which bidirectional traffic is needed, an application-aware NAT64 gateway is the best solution. The Brocade ADX Series network transition solution provides organizations scale, monitoring, and application audit capabilities. The Brocade ADX Series also supports the migration of Virtual IPs (VIPs) and real servers from IPv4 to dual stack or to native IPv6 with a complete suite of Server Load Balancing (SLB) translation services. For older applications or operating systems, Brocade provides a complete suite of SLB translations, including 664 to legacy IPv4 servers and 446 to new IPv6-only servers. While the application is in transition, one VIP—IPv4 or IPv6—can host a combination of IPv4 and IPv6 real servers behind it. The Brocade ADX Series enables efficient distribution of traffic among application and infrastructure servers using load-balancing methods that monitor server connection load, server resources such as CPU and memory, application response time, and pre-assigned server weights for an optimal application experience. The Brocade ADX Series provides uninterrupted, high-performance, and low-latency delivery of popular applications—including Microsoft Exchange, Microsoft SharePoint, Microsoft Lync, SAP, Oracle, BEA WebLogic, IBM WebSphere, and Siebel—and financial services applications based on the Financial Information eXchange (FIX) protocol. The Brocade ADX Series also provides high-performance Layer 7 features, including health checking, content switching, content transformation, and application scripting. 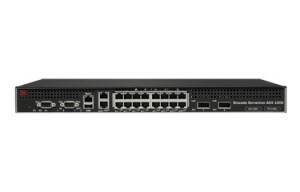 The Brocade ADX Series increases availability and scalability of infrastructure components that are critical for service delivery, including Domain Name Server (DNS), firewalls, caching devices, authentication services such as RADIUS and LDAP, and secure IPv4 and IPv6 DNS as well as DNS Security Extension (DNSSEC) servers. The Brocade ADX Series provides a highly scalable and flexible way to accelerate the creation and delivery of new, innovative cloud service offerings while maintaining predictable performance. Distributed architecture: Provides better scale and stability compared to shared memory architectures. The memory footprint of the OpenScript engine is extremely small, increasing the number of scripts that can run simultaneously. Data traffic is isolated in a separate “script memory,” localizing the impact of a defective script and making it well suited for multitenant environments. Patent-pending Brocade OpenScript Performance Estimator: Provides deterministic network performance estimates of custom scripts without running live traffic. Perl-based scripts: Enable faster execution because they run byte code and objects are passed as handles—in contrast to other implementations that use TCL, which are interpreted at run time, thus slowing performance. Objects-based flow inspection: Allows manipulation of a response based on information in the request and vice versa, and improves intelligent traffic-handling capabilities. Open architecture framework: Allows the addition of select third-party Perl modules and OpenSource libraries (such as www.cpan.org). Today’s organizations need strong protection against increasingly sophisticated infrastructure attacks and application threats. Brocade solutions provide a single security strategy to safeguard systems against rapidly evolving threats. These solutions offer network-based Access Control Lists (ACLs), scalable DDoS/SYN protection, and accelerated SSL proxy and offload. The Brocade ADX Series stops attacks from illegitimate connections and denies service to unauthorized users through hardware-based ACLs. Moreover, the Brocade ADX Series can proactively mitigate attacks by limiting concurrent connections and the rate of new connections. The Brocade ADX Series provides protection against DNS amplification attacks by inspecting DNS packets for query names, query types, and other DNS flags, and then enforcing security policies. The Brocade ADX Series drops or rate-limits these packets without sacrificing overall DNS delivery performance. Moreover, the Brocade ADX Series provides simple and hassle-free integration with DNSSEC service without disturbing the provider’s pre-existing certificate management policy framework. The Brocade ADX Series offloads CPU-intensive Secure Sockets Layer (SSL) negotiation and connection management tasks from application servers, thereby freeing up CPU cycles for application delivery and improving application response time. With the new SSL acceleration module, the Brocade ADX chassis-based system supports the advanced 2048-bit SSL acceleration, providing a 70 percent performance gain in new SSL sessions per second. DDoS/SYN attacks are becoming increasingly severe, with attackers launching sophisticated attacks and even building botnets in the cloud. The Brocade ADX Series leverages its distributed hardware architecture to offer maximum protection against several forms of DDoS attacks, preventing up to 120 million attacks per second while ensuring the undisrupted flow of legitimate traffic. The Brocade ADX Series OpenScript programming toolkit enables administrators to create customized security policies to respond to unknown attacks. In addition, OpenScript can provide protection from key application vulnerabilities while permanent application patches are installed. The Brocade ADX Series provides a rich collection of tools to deploy, manage, and monitor Brocade ADX devices, providing greater administrative control over the network. 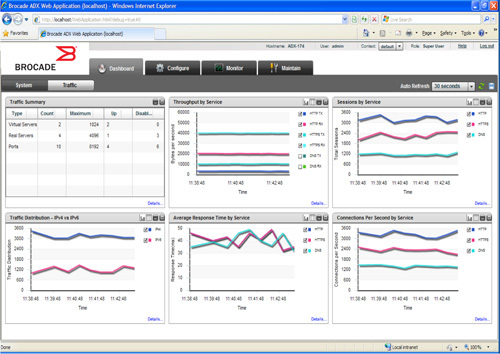 The Brocade ADX Series features a dynamic Web-based Graphical User Interface (GUI) that leverages the XML API to provide an intuitive system dashboard for detailed traffic and system statistics, simplified navigation, configuration management, and real-time system monitoring of Brocade ADX switch deployments. The Brocade ADX GUI helps simplify management by providing organizations with maximum visibility into the overall health of their Brocade ADX systems (see Figure 4). Figure 4. The Brocade ADX Series Web-based Graphical User Interface (GUI). The Brocade ADX Series includes a powerful Command Line Interface (CLI) that simplifies device management and reduces the administrative learning curve by incorporating an industry (de facto) standard look and feel, tab completion, and in-line help. The Brocade ADX Series allows organizations to create multiple administrative domains and assign access privileges to users inside these domains, enabling custom views for different types of administration. The Brocade ADX Series leverages a standards-based SOAP/XML API that integrates control of Brocade ADX switches with both custom and third-party orchestration and automation tools. Application professionals can leverage the rich XML API extensions—from basic load balancing and system management to advanced services—to increase operational efficiency and improve the performance and reliability of their applications. Brocade Application Resource Broker enables automated provisioning of Virtual Machines (VMs) within heterogeneous virtual environments, including VMware, XenServer, and Microsoft Hyper-V (see Figure 3). It simplifies the management of application resources and ensures optimal application performance by dynamically adding and removing application resources within globally distributed data centers. Brocade Application Resource Broker—which works in tandem with the Brocade ADX Series—provides these capabilities through real-time monitoring of application resource responsiveness, traffic load information, and infrastructure capacity information from server infrastructures. Brocade ADX plug-ins allow service organizations to extend their orchestration environments to support the dynamic control of their application delivery infrastructure. Using these plug-ins, they can integrate their systems with open cloud frameworks such as CloudStack and OpenStack, as well as third-party management solutions, including VMware and Microsoft. Brocade Communities provides a thriving social networking venue where information and ideas are shared. Visitors can connect with industry peers and Brocade leaders, share thoughts and opinions with other members, and learn about the latest product development, solutions, and technology trends. The Brocade ADX OpenScript community: Is changing the way application development and delivery professionals learn about, share, browse, and contribute dynamic application scripts. For more information, visit http://community.brocade.com/openscript. The Brocade Application Delivery Infrastructure (ADI) community: Focuses on Brocade ADX products and associated partner technologies, and provides resources for real-time discussions, the latest product information, configuration examples, and implementation guidance. To learn more, visit http://community.brocade.com/adi. Brocade helps organizations easily address their information technology requirements by offering flexible network acquisition and support alternatives to meet their financial needs. 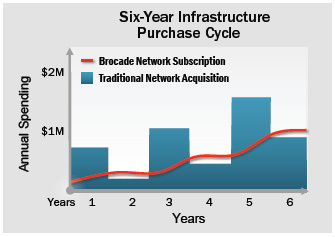 Organizations can select from purchase, lease, and Brocade Network Subscription options to align network acquisition with their unique capital requirements and risk profiles. Brocade Global Services has the expertise to help organizations build scalable, efficient cloud infrastructures. Leveraging 15 years of expertise in storage, networking, and virtualization, Brocade Global Services delivers world-class professional services, technical support, and education services, enabling organizations to maximize their Brocade investments, accelerate new technology deployments, and optimize the performance of networking infrastructures. Brocade ServerIron ADX Series Datasheet.